Bayfield Ford provides Barrie drivers with a comprehensive collection of quality winter tires from well-known brands like Goodyear, Bridgestone, and Michelin. You can compare winter tires by price, by quality rating, by features, and rebates to quickly and easily select the best set of tires for your needs. Once you find a right fit, contact us directly to set up an appointment for installation. We also offer the storage service for your summer tires from only $59.95. At temperatures below 7oC, standard tires progressively lose flexibility, leading to a decrease in traction, handling and vehicle control at lower temperatures. However, the rubber of a winter tire remains supple through temperature decreases and has more sipes - the small cuts in the tread block - which cut through surface water and increase handling control and safety on the road during fall and winter. In fact, the braking distance of a winter tire compared to a standard tire, depending on speed and road conditions, can be up to two vehicle lengths shorter. How does the winter tire insurance discount work? Since January 1st, 2016, all car insurance company's in Ontario are legally required to gives you a discount on your insurance rates for having winter tires on your car. How your insurance company offers the discount may vary, so make sure to ask yours how it works for details. You may be required to have the winter tires installed by a certain date, for example. In general, the winter tire insurance discount comes to around 3 to 5 percent of your policy. If you have questions about this discount and how it works, contact your insurance provider! What specials and program for tires that you currently offer? 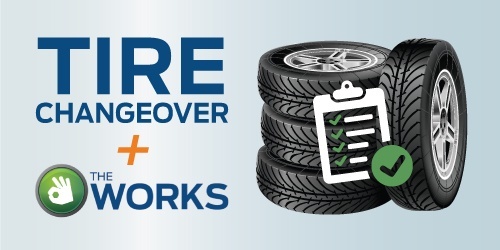 A switch to your summer tires combined with The Works is a great way to get your vehicle ready for the warm weather! Not only does it include an oil and filter change, but also an (up to) 83 point inspection! We’ll give you a comprehensive vehicle report card so that you know how your vehicle is doing! Starts at $99.95 for summer tires already mounted on rims. Once we've swapped out those wheels, your set will be tagged and coded to your personal account. They are then securely stored until you need them again. Coming in for routine maintenance this month? Swap and store your tires at the same appointment. Take back your space!